Maplewood NJ Theater Article Needs Help! I received agreement from a NJ-based magazine to print an article on the history of the Maplewood Theatre. I’ve found tons of information, even Wurlitzer organ recordings made by Thomas Edison, lists of famous people who were there… TONS of stuff. Well here is one picture from behind a dropped ceiling between two of the smaller screens… I just took this two days ago. I really am looking for period photos… especially the original marquee! 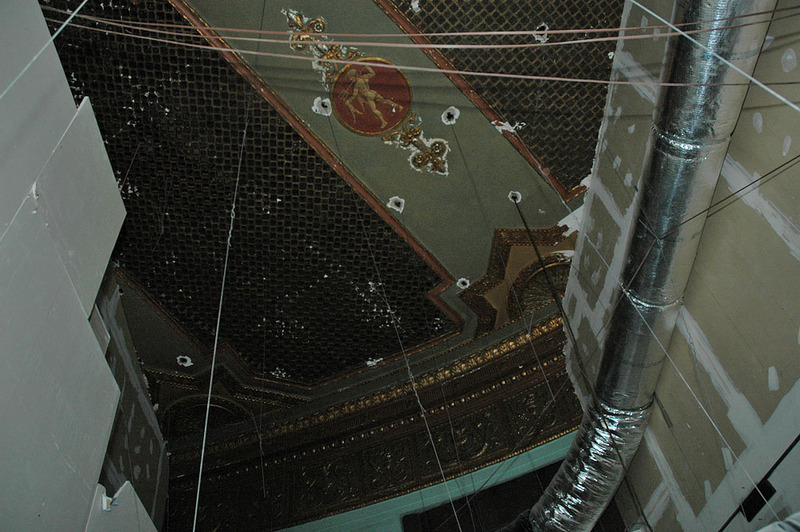 That photo betrays that the MAPLEWOOD was a movie palace or earlier legit that was ‘modernized’ —or desecrated as most theatres buffs would see it! In any case, your best bet is the Theatre Historical Soc. of America, where on the front page of their web site ( www.historictheatres.org ) you will find a link to their Ex. Director who, if you E-mail him, can tell you if they have anything among their thousands of photos, and if not, will direct you to other possible sources such as the magazines you spoke of. However, often the best source for theatres not in major cities is locals. Have you contacted libraries (school/college as well as public), historical societies, your closest state university library and school of architecture, your state officer of Historic Preservation, local newspapers to find opening day ads and articles which can lead you to the original owners' descendents (maybe with the help of a local geneologist), the original architects and contractors/suppliers who could still be around with old, old files in someome’s attic? The Register of Deeds for the area should have documents that often reveal names of people originally involved, as do the archives of building permits for that municipality; city hall can answer that question. Ask a proment local property insurance salesman if the place was ever insured and who wrote the policy and then contact that company; they will probably also have record of the theatre’s attorney, and his office records could well offer up a photo. Old neighbors often have photos/snap shots in which neighboring lots and buildings appear accidentally; it may mean going door to door, but you will be surprised at the stories and memories you will find! A long shot is to contact appraisal companies, first in New Jersey, and the across the nation (almost all have web sites allowing you to E-mail them) who may have photos they will copy for you; try to get to their Public Relations dept. before their lawyers find out about your inquiry, since ‘client confidentiality’ will be their theme and they will brush you off —even if their original client has been dead for a century. Yes, it is a lot of slow work tracking down old photos, but if you want others to do it for you, it will be expensive! BEST WISHES! As to the original marquee: if it was a large spectacular for its place and time, it is possible that it appeared in SIGNS OF THE TIMES magazine (now celebrating their Centennial, with back issues at many libraries) but I doubt it is indexed back to the opening of the MAPLEWOOD, though it could have appeared in a photo ad by its maker. If you can learn the name of the signage contractor, you might be able to track them down and they may well have photos. Sometimes an electrical contractor was involved and you might locate the firm. If the marquee was only recently removed, see if you can find the salvage/demolition company that did the work (names often in demo permits at city hall) and it is possible that the thing is sitting in a scrap metals yard they know of. Is there a local office of the electrical workers' union? Possibly they have records of who worked on that job, and who knows which of those guys may have taken a snap shot?